This is vacuous. It rivals Bill Acklin’s wow factor nonsense. Another rara councillor with superficial thinking. The stadium might be great for rugby. Nothing new there. That is what it was built for. The stadium finances obviously don’t feature for Andrew. The stadium experience may have approached an orgasmic high for him, but may I suggest the real thing is a darn more cheaper. There is a mentality here. Stadium….aw…..must be good….money for Dunedin. 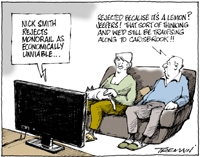 Oil/gas exploration….aw….must be good….money for Dunedin. No questions asked, doubts raised….kneejerk reaction. We deserve more critical thinking than this. The impact is huge. Embrace the pain. Offer your suffering up to Jesus. And dance to the masochism tango. Ole! Dunedin. World-class city of the Dunce, sorry Dance. He was right in one way. The impact of the stadium is huge, but not in the way he thinks it is. I don’t know the guy personally, but is he just toeing the party line to get in with the big boys or does he really believe the crap he espouses? Either way it doesn’t really matter, but intelligence or critical thinking is not defined by one’s level of education or social status. Remember Michael Guest….lawyer/judge. “One’s intelligence or critical thinking is not defined by one’s education or social status.” That is fu#@#ng brilliant! That comment is so succinct that one might expect it to be a quote from Edmund Bourke or Churchill. It represents everything that I have always believed that (with regards to intelligence) “you can’t put in what God left out; and conversely “you can’t take out what God put in”. Andrew Whiley may well have figured out that arguing against previous council decisions will not get you promotion from the mayor and therefore sufficient income for your family to live. Great politicians go with the flow. That is why we get the quality of elected officials in New Zealand we deserve. The whole concept of democracy as a popularity concept is a completely flawed edifice. Lee Vandervis has been sidelined, Hilary Calvert has been sidelined. Andrew Whiley believes in caucus responsibility. Remember a knighthood is granted for three successful terms. Live with it, you are no longer in control. Nah, John. Cull’s like the earwax TV3 found in the mouth of Banks. Andrew Whiley waxes with enthusiasm over the experience he and his son enjoyed at the stadium for the Highlanders Crusaders rugby match. Fair enough. He then says there was over 20,000 folk there and it will be repeated on the ‘test’ weekend. He is probably right. Local residents, students and visitors make an “economic win” he says. But hold on, the 20,000 paid entry money to go and at, say, an average of $25 per seat that would gather $500,000. Wow! But hold on again. Ask himself where that money went. It didn’t go to DVML because it only gets a fee for the hire of the stadium. We know that by the parlous returns over the year such that it struggles to pay the $4 million rent to DVL to service its debt. No, that money goes to rugby, and most travels out of Dunedin into the NZRFU’s coffers, from where it is doled out to franchises for their expenses. So no windfall for the city there. Then of those 20,000, by far the greater are local citizens with a lesser percentage of outside visitors. That means the additional spend post-match in the hospitality sector is largely “local churn” or transfer from one to another with no gain. The only gain would be the visitors that stayed overnight, which amount to not many as most would head off home straight after the match. This is the same for all stadiums no matter the size or frequency of crowds. I suspect if there was an independent, unbiased assessment of the event it would show practically no ‘economic benefit’ to the city at all. Sure the appearance is there but the fact is not. That Andrew Whiley sees this as justification for the stadium being totally debt funded by the ratepayers is a great worry. He, of all people, being an elected city councillor should be conscious of these facts. Looks like he is in the same mould as the likes of former Crs Acklin, Collins, Guest, Walls et al. Very depressing. “The only gain would be the visitors that stayed overnight,” and often they stay with family or friends, both to save money and to spend some time with people they enjoy catching up with. Hype. Don’t be a spoilt sport by minimising the multiplier effect. Some swear by it……when it suits. Is the golf course that keeps him semi employed council owned ? Yes – the last time I looked Chisholm Park was Council owned. Is Andrew actually employed by the DCC or does he just lease the property? Never heard of a council running a golf course, but who would know in this neck of the woods. It owns a stadium after all. Last time I looked Dunedin City Council owned Chisholm Park Golf Links and Whiley (or a consortium of his) was the lessee (tenant). Incidentally, is Whiley a relatively recent migrant; a bit like Kim Dotcom. Does he have citizenship status? A former Dunedin City Councillor slipped through that net and represented Council holding only residency status. He was a nice guy and to his credit didn’t hang around once he became aware of his (genuine) ignorance. What say you all? NZ Electoral law says that you must be an NZ citizen to stand in any election, local or national. Yes I know that. My question was ‘does he have citizenship status?’ Ok – let’s be clear – does Whiley have NZ citizenship status? If not he needs to be ‘gone by lunchtime Tuesday’. Forgive me, but why is the question being asked? Is this baseless speculation or does someone have Facts ? With Pam Jordan as the Electoral Officer I can’t for the life of me think that an error was made where citizenship is concerned. His councillor profile says born in Wellington. There is no mention of citizenship. He declares his interests, as listed. OK – we can tick that off the bucket list. He is not Canadian as has being rumoured. But I don’t resile from asking the question. The only silly question is the one that is never asked.